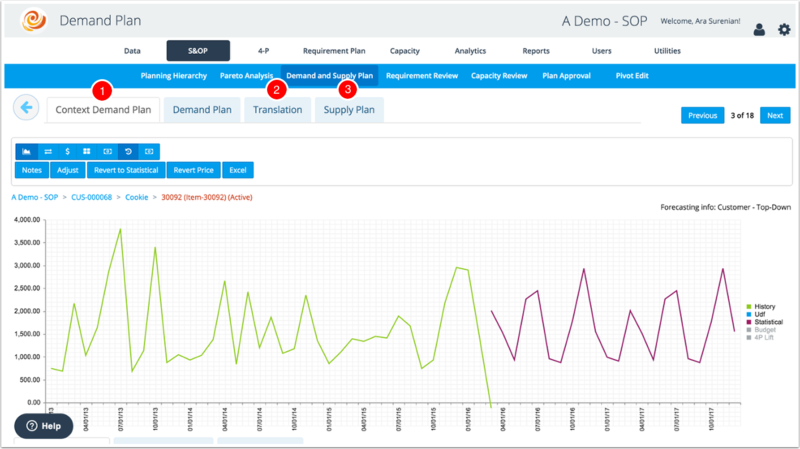 This article provides an overview of the layout of the Demand Planning graphical interface. Returns and Net Sales: Click to show any returns and the net sales value. Cost and Margin: Click to show the nodes cost and margin values. Units Waterfall: Click to show only units in the waterfall. Currency Waterfall: Click to show only currency in the waterfall. Full Waterfall: Click to show both currency and units together. This is the default view. Notes: Allows the user to add a note related to the view. Adjust: Allows the user to adjust price or the demand plan as a percent increase or decrease. Revert Statistical: Reverts any edits made to the demand plan back to the statistical calculation. When clicking this option, all edits made to the context demand plan below the level will revert to statistical. The higher in the hierarchy a revert is initiated the more edits are reverted back to statistical. Includes reverts to any edits made to unit price back to the statistical calculation. Excel: Downloads an excel version of the table. Includes the cost and margin. 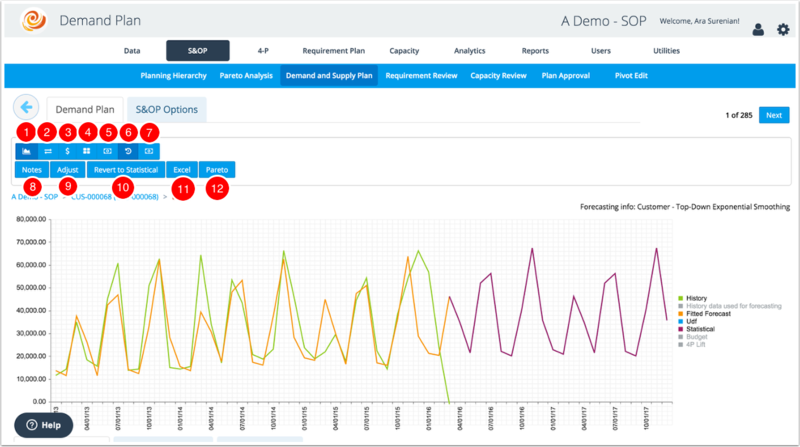 Demand Plan view includes a graph, demand plan table, waterfall, and a number of view options. The graph is described below. Demand Plan Tab: Provides the sum of all demand plans for a specific item. This is the demand plan that translates into a supply plan. 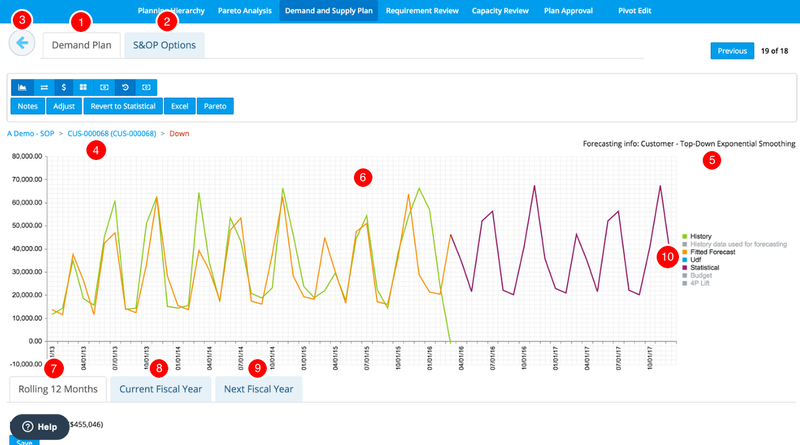 S&OP Options Tab: Provides the forecasting options for the demand plan. Only shown at the forecasting level - see detail below. Back Arrow: Take the user back to the list view. View Breadcrumb: Provides the context of the view. Plan Description: Describes the basis of the demand plan. The level it was generated and the type of forecasting method used as described in the Demand Plan Process Steps article. Demand Plan Graph: The green line is actual, orange line is the fitted forecast, and the purple line is the statistical demand plan. When the demand plan is edited and differs from the statistical forecast, a Blue line appears that represents the edited demand plan. Rolling 12 Months: Shows the demand plan from the current month through 12 months. All the demand plan and average selling price (ASP) fields are editable unless otherwise locked via system settings or 4-P.
Current Fiscal Year: Shows the current fiscal year where values prior to the current month show actual vales versus the demand plan. The balance of the current fiscal year demand plan and average selling price (ASP) fields are editable unless otherwise locked via system settings or 4-P.
Next Fiscal Year: Shows the demand plan for the next fiscal year. There is also a Future tab if enabled in system settings, shows the demand plan the year after next (not shown). 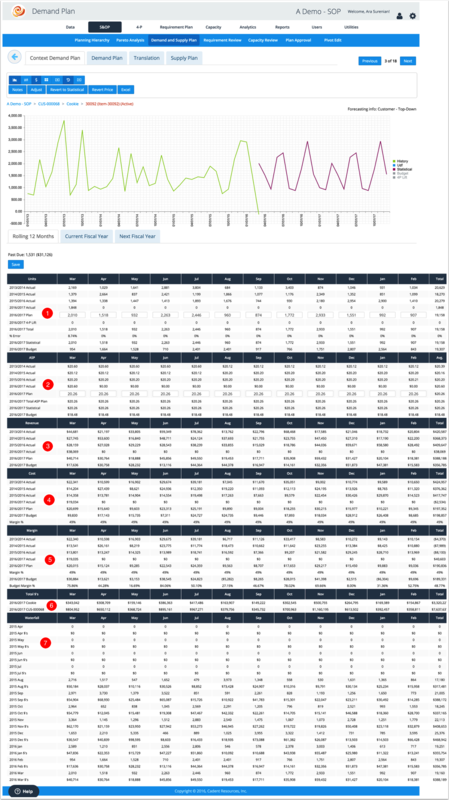 Provides the ability to automatically remove outliers at the forecast level. In middle-out, the outlier is removed at the lower forecast level. Provides the ability to choose an alternate forecast method via the drop down. The item level includes additional options that are not available at the upper levels. Context Demand Plan Tab: Provides the demand plan at the context detail. Translation: For multi-location (DRP) companies, this translates the demand plan to a location specific supply plan. This tab is only viewable in the Context Demand Plan view. Supply Plan Tab: Provides the supply plan detail for the item. The Supply Plan tab is also visible at levels below the customer and above the item level. Units: The demand plan in units. 3 years of history and the current year are also provided in the view in addition to statistical forecast and budget. Other rows such as point of sales data and other demand plan inputs are also included when enabled. ASP: The average sales price for the view. This is calculated from the sales orders history using a period of time as defined in the system settings. Revenue: Calculated as units times ASP. Historical revenue is actual revenue. Cost: If enabled in view via the tool bar, the cost based on data provided in customer order table or current cost if historical cost is not provided. Margin: If enabled in the view via the tool bar, the gross margin value. Total $'s: Is the sum of the context levels above the current level. Waterfall: The waterfall shows how the plan has changed each month over time. The current fiscal year view shows the actual values in green. As each month passes during the fiscal year the actual value is populated and becomes green thus forming a waterfall over time.